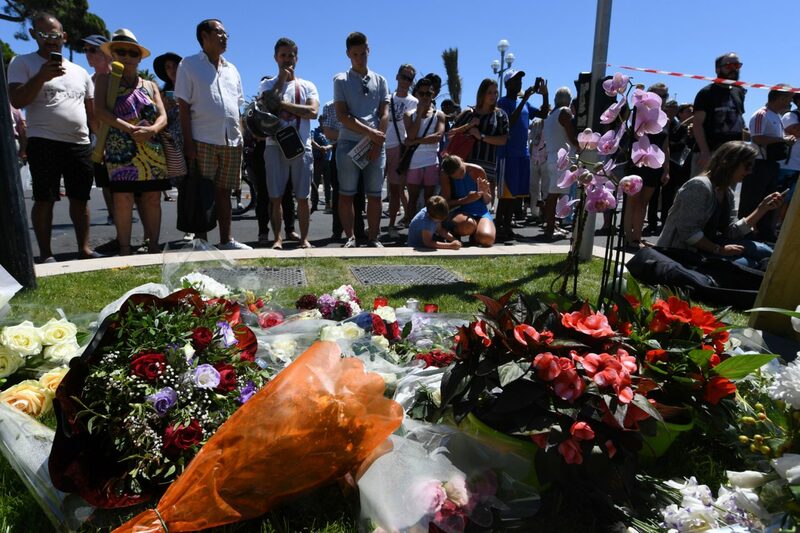 At least 80 people , including 10 children, have died and dozens were injured during Bastille Day celebrations in Nice, France after a truck ran into a large crowd. Police are treating the incident as “an attack” and French President François Hollande declared it an “undeniable” terrorist attack. The suspect has been named locally as a 31-year-old French-Tunisian called Mohamed Lahouaiej Bouhlel. Witnesses claim he shouted “Allahu Akbar” – which means God is greatest in Arabic – before opening fire on officers. CBS News is reporting that University of California at Berkeley student Nick Leslie, 20, has been unaccounted for since the Thursday night massacre. Leslie was participating in Berkeley’s “Entrepreneurship and Innovation in Europe” program. Two other students from the program suffered broken legs in the attack, while a third has a broken foot. The program is scheduled to last until July 24, but CBS says three of the students have elected to come home to the U.S. early. 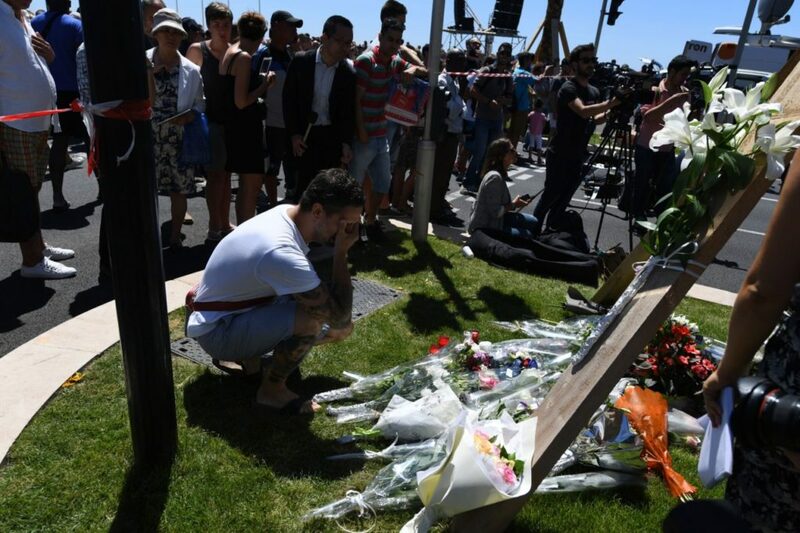 Sky News Pins Blame for Nice Attack on ‘Disenfranchisement’: A Sky News correspondent asks a human rights activist about the “sense of disenfranchisement” among North African communities in France. The Automobile Is Becoming the Weapon of Choice for Islamist Killers: A crowning achievement of Western civilization becomes an affordable, readily-available, highly effective weapon against its own people. 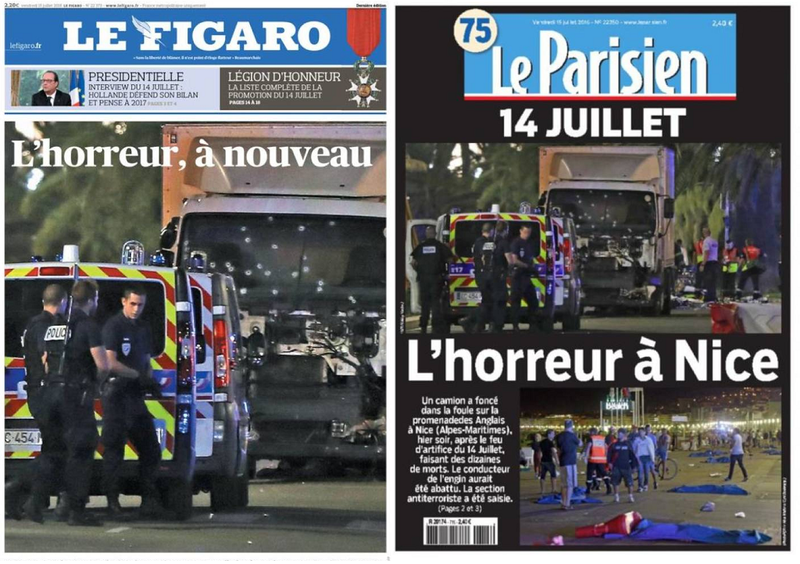 The UK Independent is reporting that the attack on Nice would have been even more horrendous, but for the heroic actions of an as-yet unidentified man who threw himself into the cab of the truck when it struck an obstacle, and wrestled with the murderous driver, who was armed with a revolver. 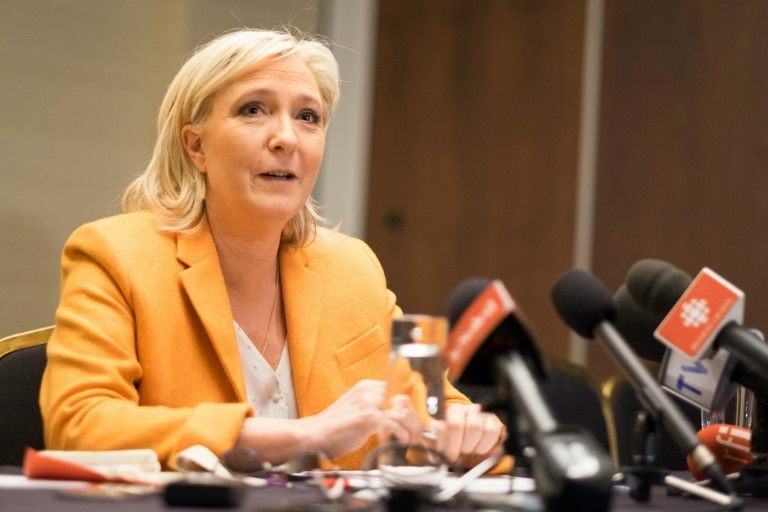 “We need much better intelligence, much better coordination of intelligence inside France, among Europeans, with our neighbors controlling our borders – particularly the Turks. This is not happening fast enough,” Lellouche told the BBC. Lellouche made the devastating observation that “a violent tactic from the Syrian civil war has now come to the streets of Nice,” so “the Middle East and Europe are now part of what he calls the same strategic space,” as the BBC put it after interviewing him. 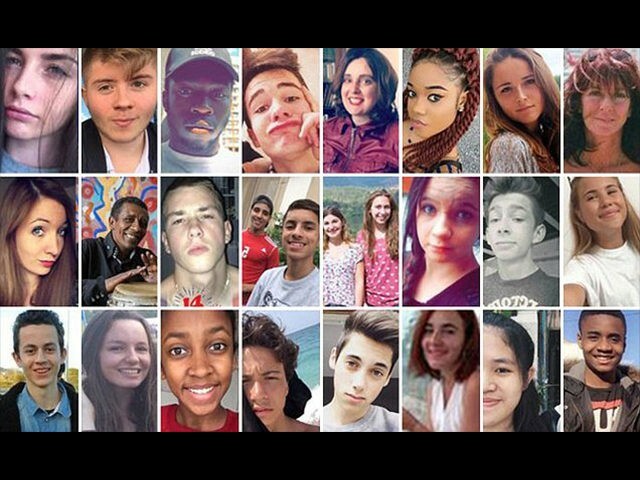 #NiceAttack UPDATE: 10 children or adolescents among the 84 killed. Driver shot at 3 police officers. The French Prosecutor has given an update at a press conference. The death toll remains 84, he says, and “202 people were injured including 52 who are now in critical care”. “Among these 52 people 25 are still in intensive care,” he adds. He says the numbers are preliminary and they could increase. “They have managed to neutralize this person, thus avoiding further victims. I would also like to pay tribute to all state services who were mobilized following this attack.” He thanks doctors and other emergency providors. He says that authorities are now in the process of identifying the dead, “which is painful for the families of the victims”. 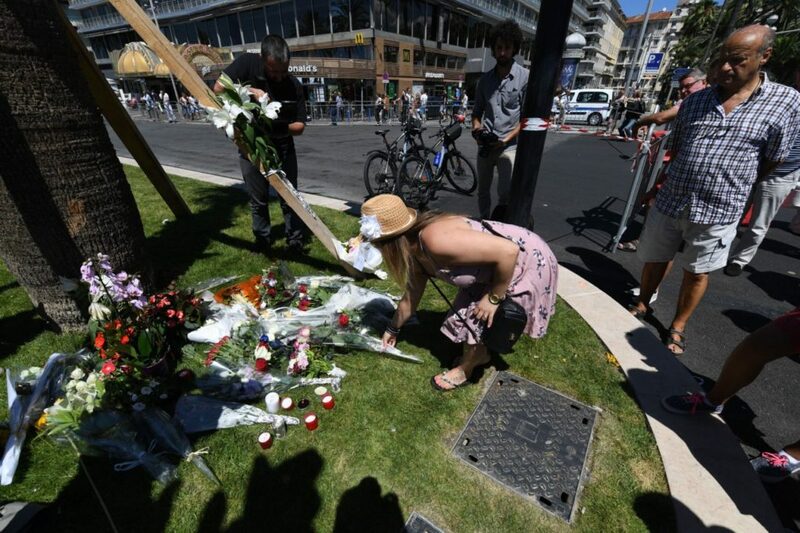 JAFFA, Israel – Reactions to the truck-ramming terror attack in Nice on Thursday, which left more than 80 people dead and 100 injured, dominated Arab social media. Some Islamic clerics denounced the attacks, to the protest of others. Breitbart Jerusalem says that a top Salafist jihadist based in the Gaza Strip has claimed more “brothers” are planning attacks. Abu Alayna Al-Ansari, an IS loyalist, said he believes the attack was a “classic lone wolf” operation, inspired by the jihadi Abu Mohammad al-Julani, the IS spokesperson, who called upon young Muslims from around the world to carry out attacks such as Thursday night’s. Ansari is a well-known Gazan Salafist jihadist allied with Islamic State ideology. In previous interviews, Ansari seemed to be speaking as an actual IS member, repeatedly using the pronoun “we” when referring to IS and even seemingly making declarations on behalf of IS. AFP reports 50 people remain in a “critical” condition. “As I speak 84 people are dead, and around 50 are in a critical condition between life and death,” French President Hollande said after visiting a hospital in the French Riviera city. UKIP criticises British PM Theresa May for not taking a more hands-on approach in response to the Nice attack. “My thoughts go out to the friends and families of those who died and of course it is heartbreaking that there are young children involved but these terrorists have no limits to their murder. “Once again this highlights the foolishness of open borders with not only 1.8 million migrants coming in but free movement of weapons probably including those which were found in the cab of the lorry. “As Home Secretary Mrs May oversaw the collapse in funding and support for the UK border force and I would have thought as a new prime minister hitting the ground running, ,making COBRA her first responsibility. “She should have used it to show her intention to get a grip of this crisis. “Mr Cameron may well have responded on twitter but what we really need is to have better border security and to raise the level of the alert. Dr Sebastian Gorka and Oliver Lane were on Breitbart News Daily on Sirius XM this morning to talk about the Nice attack. King Salman of Saudi Arabia has sent a message to French President François Hollande, insisting that his nation stands with France against terrorism in all forms. Germany will boost border controls at airports as well as road and rail crossings into France after the truck attack in Nice, the Federal Police said on Friday. “In coordination with the French security authorities the federal police are strengthening their control in the area of cross-border traffic into France,” the police said in a statement. The Daily Mirror is reporting that “witnesses” have claimed the driver and suspected terrorist shouted “Allahu Akbar” – which means God is greatest in Arabic – as his vehicle came to a stop, before opening fire on officers. 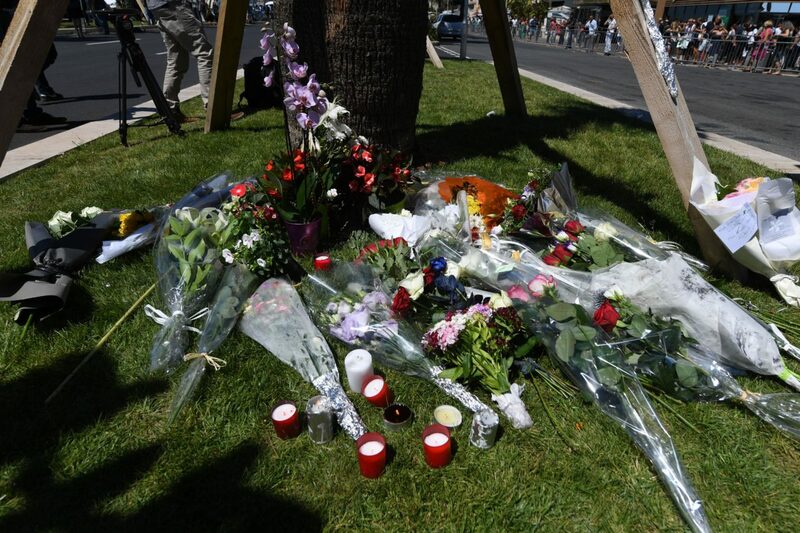 A memorial has sprung up in Nice. “I am shocked and saddened by the horrifying attack in Nice last night. 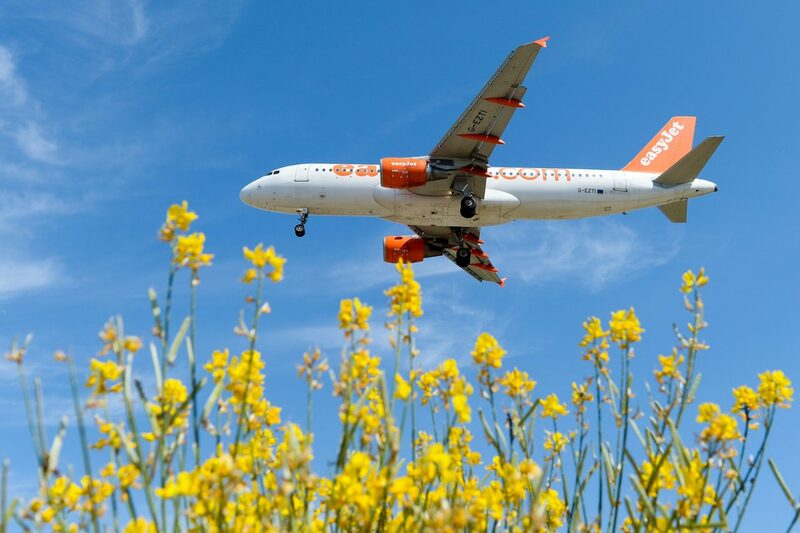 Our hearts go out to the French people and to all those who’ve lost loved ones or been injured. “While the full picture is still emerging, it seems that at least 80 people are feared dead and many others have been injured. These were innocent victims enjoying a national celebration with their friends and families. 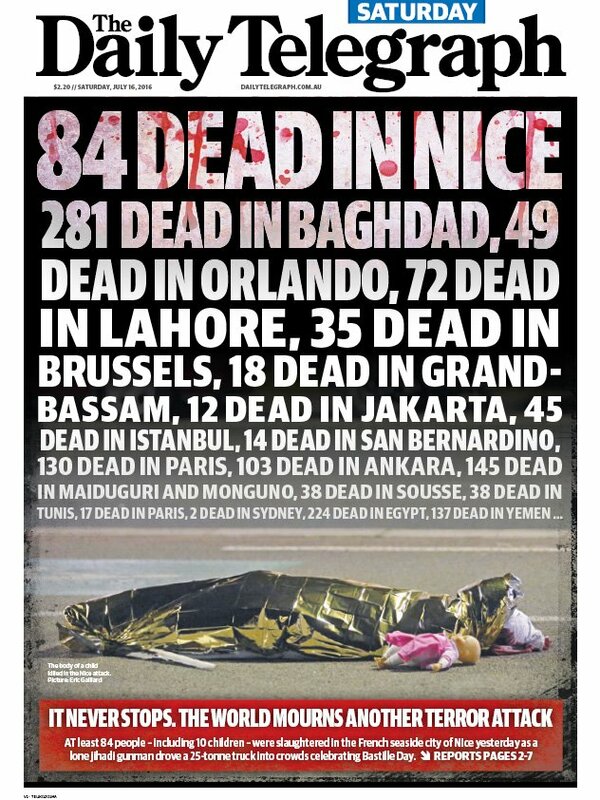 “We are working urgently to establish whether any British nationals were caught up in the attack. Our ambassador is travelling to Nice today with consular staff and they will be doing all they can to help anyone affected. “I have asked my deputy national security adviser to chair a COBRA meeting of senior officials, to review what we know and what we can do to help, and I will speak to President Hollande today and make clear that the United Kingdom stands shoulder to shoulder with France today, as we have done so often in the past. 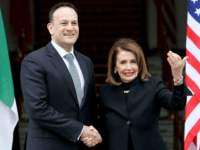 “Nothing that we have proposed has been put in place. Considering the new nature of terrorism which is now a terrorism of opportunity, that’s to say without hierarchical structure, the urgency is to attack the ideology on which this terrorism is based. A label on the side of the truck suggests it was hired from Via Location. A spokeswoman for the company said she could not discuss the matter, citing an instruction from the interior ministry. She has called an emergency COBRA meeting. France’s ambassador to the UK spoke on the steps of the French embassy in London. “All our thoughts are with the victims and the families of the victims,” she said. 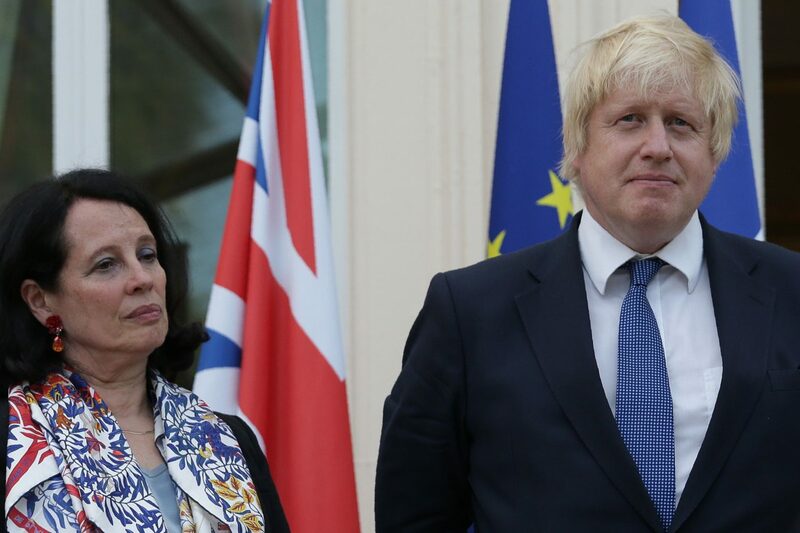 She also thanks the British government and UK politicians for their words of support, pointing out that Boris Johnson, the new Foreign Secretary, was at the embassy yesterday for Bastille Day. 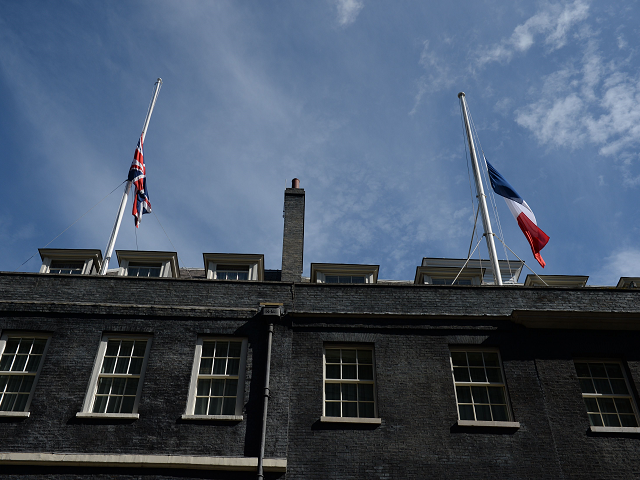 A half-mast Tricolour flies above No.10 Downing Street today, the official London residence of the British Prime Minister Theresa May. 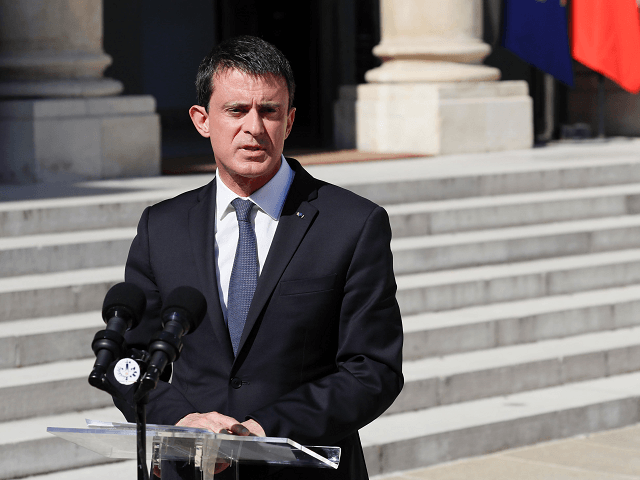 France has declared three days of national mourning in the wake of the Nice attacks from Saturday, and the national state of emergency which has been in force since the Bataclan attacks has been extended until at least October, Prime Minister Manuel Valls announced. He said France should not be “destabilised” by the attacks. Breitbart London reported Tuesday on the remarks of the head of the French security service Director General Patrick Calvar who said if there was another Islamist Terror attack against his country he foresaw a “civil war” coming. Predicting what he called “far-right” groups would begin reprisals against Muslims in France for the attacks, he said: ” You will have a confrontation between the far right and the Muslim world – not the Islamists, but the Muslim world”. A police source said the Director General feared another big terror attack particularly because it would prove to the French people that their government lacked the resources or ability to stop terrorism, leading to a rise of vigilantism. 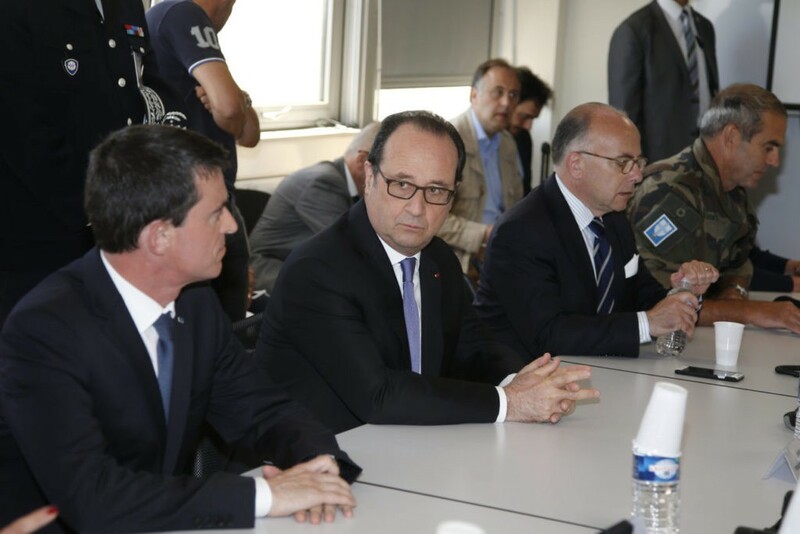 BREAKING: French president Hollande says 77 people killed in Nice, including children, 20 gravely wounded. 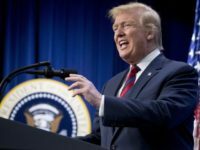 On Fox News, Trump repeats statement that Clinton “created ISIS with her crazy policies"
A fire nearby the Eiffel Tower earlier reported not to be related to terror attack. CBS now reporting 77 dead in Bastille Day terror attack in Nice, France. AP confirms terror truck was loaded with arms and grenades. Reuters reports the driver of the vehicle was killed by police. Police shot and killed the driver, who drove at high speed for over 100 meters (yards) along the famed Promenade des Anglais seafront before hitting the mass of spectators, regional sub-prefect Sebastien Humbert told France Info radio. Donald Trump postpones announcement of VP running mate due to France terror attack. Blood. Groans. Sunbathers [on the beach near the promenade] were first at the scene. They brought water to the wounded and towels they filed where there was no hope. At this time, I lacked courage. I wanted to help, to be of service… in short to do something. But I did not succeed. 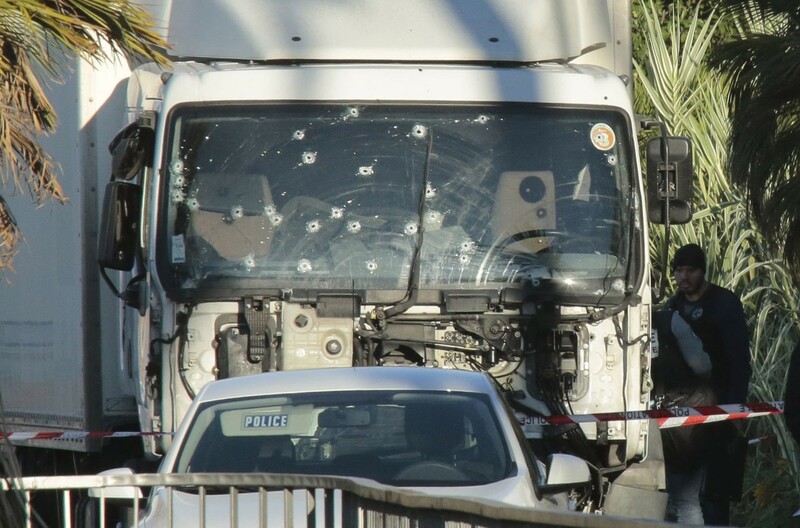 Update: 7:02PM EDT: Le Monde reports that the Interior Ministry cannot confirm rumors that grenades or explosives were found in the truck, which are circulating in French social media. Update: 6:41PM EDT: French Interior Ministry spokesperson denies that an ongoing hostage situation is occurring. Update: 6:35PM EDT: France’s iTele is now reporting that a man hiding in a restaurant nearby, believed to be involved in the attack, has been killed. Update: 6:35PM EDT: Witnesses are now confirming that they saw police shoot the driver dead after he ran out of the truck. The Daily Mail is reporting that there were multiple gunmen, and that some eyewitnesses say that hostages were dragged into various locations near the celebrations. The newspaper is citing the Meridien Hotel, the Hotel Negresco and the Buffalo Grill restaurant as hostage locales, though officials have not confirmed this. Update: 6:22PM EDT: Nice’s prosecutor’s office has raised the death toll to 60, according to reports. Update: 6:17PM EDT: France24 is reporting that the driver of the truck is dead, though it has not been specified whether he was killed by police or killed himself in the attack. Eyewitnesses say the driver ran out of the truck after plowing through the crowd and began shooting. “”Everyone was calling run, run, run there’s an attack run, run, run. We heard some shots. We thought they were fireworks because it’s the 14th of July,” an eyewitness told France’s BFM TV, according to a BBC translation. The Telegraph adds that several eyewitnesses have confirmed that they also heard gunshots coming from the truck, confirming the nature of the incident. Various Twitter users have contributed photos of the truck allegedly involved in the incident. In an emergency press conference, Nice Mayor Philippe Pradal has confirmed that “tens” are dead, though he could not provide a more specific number at the moment. Este es el camión que ha embestido a la multitud en Niza tras ser neutralizado.